Tinker Town Tiger: All the wise guys are picking the LSU football team #3 in the SEC West in 2017. All the wise guys are picking the LSU football team #3 in the SEC West in 2017. Looking at the SEC rerun of the 1980 Georgia vs Florida College Football rival in Jacksonville Florida., And Georgia radio announcer Larry Munson calling the winning touchdown run of WR Lindsay Scott. I am left with the feeling that the University of Georgis Bulldogs is over do for a revival to becoming one of the Super College Football Teams in America again. Georgia became almost good enough coached by Mark Rich who is, of course, a very good college football coach. But Georgis recruiting just could not keep up with the #1 recruited teams of Nick Saban's Alabama Crimson Tide. For the past 10 years, no one has been able to match Alabama recruiting powers in the South Eastern Conference. So will the Big College Football Powers from the SEC past come back into prominence or not, Tennessee, Georgia, Florida, and Alabama. All the other SEC teams except for LSU college football run in early 2000 when and where LSU was able to make a big Show hanging with the perennial College Football Super powers. Breaking away from being just another back in the pack SEC teams hoping to upset someone high and mighty every now and then. LSU running back Derrius Guice at SEC meeting. LSU has been picked to finish third in the Western Division by SEC Football Media Days voters. 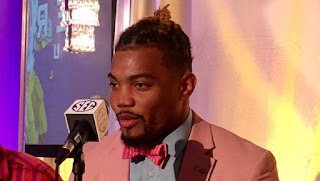 Also, running back Derrius Guice and linebacker Arden Key were named to the preseason All-SEC first team, and Guice was on the second team as an all-purpose selection. Also on the second team were on the offensive tackle K.J. Malone, defensive lineman Christian LaCouture and defensive back Donte Jackson. Offensive lineman Will Clapp and defensive lineman Rashard Lawrence are on the third team. In the vote totals released by the conference this morning, the Tigers trailed Alabama and Auburn in the Western Division, but were ahead of (in order) Arkansas, Texas A&M, Mississippi State and Ole Miss. For the sixth time in the last eight years, Alabama was chosen to win the conference. Also, Alabama had the most first-team All-SEC selections this season with 10, which is a new record for the SEC Media Days All-SEC team. "The leadership on this team is pretty good," Alabama wide receiver Calvin Ridley said. "We have some guys who are buying in right away and now we have to get the younger guys to buy in." Predicted Eastern Division winner Georgia received the third most votes behind the Tide (Auburn was second) to win the league title.